Home » Academics » Schools » Greehey School of Business » Faculty » Denada Ibrushi, Ph.D.
Denada Ibrushi, Ph.D., is an Assistant Professor of Finance at the Greehey School of Business at St. Mary’s University. She holds a Ph.D. in Finance from HEC Montreal in Canada. Ibrushi’s teaching interests consist of, but are not limited to, investments, corporate finance and financial markets. She has taught several finance courses at HEC Montreal and Epoka University in Albania. Ibrushi’s research interests span the fields of empirical asset pricing, financial econometrics and macro-finance. 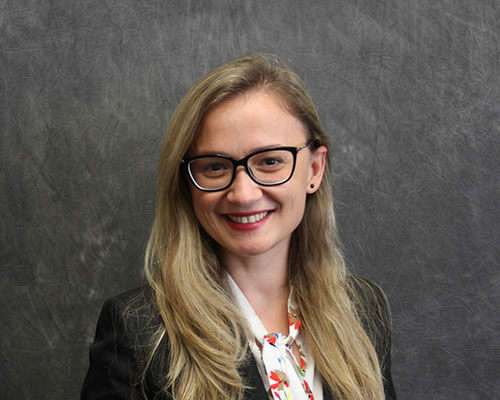 She has presented her work at the European and annual meetings of the Financial Management Association, and at the HEC Montreal-McGill Doctoral Workshop, where she earned the Best Presentation Award. She completed the last term of her Ph.D. at HEC Liege in Belgium, where she worked with two co-authors on news analytics and their impact on stock prices. Ibrushi enjoys learning foreign languages, traveling and exploring new cultures. Some of her awards and honors include the Mitacs Globalink Research Award in 2018, the Alma Lepage Scholarship from HEC Montreal in 2016, the Mid-Program Doctoral Scholarship from HEC Montreal in 2015, and a research fellowship from the Montreal Institute of Structured Finance and Derivatives in 2014. Cenesizoglu, T., Ibrushi, D., 2017. Time Variation in Cash Flows and Discount Rates. Working Paper, Social Science Research Network. Ibrushi, D., 2014. Forecasting and Hedging Systematic Risk. Technical Notes, Montreal Institute of Structured Finance and Derivatives.